Kids will have hours of fun with the all-new John Deere Ground Loader! 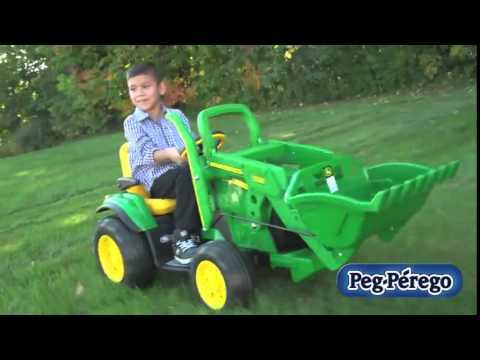 This extra-large John Deere tractor with a working front loader brings a child’s imagination to life. Your three to seven year old will enjoy scooping up their load, driving to their destination and dumping it from the driver’s seat. The adjustable seat has flip-up armrests, perfect for growing children. The 2-speed shifter with reverse allows them to drive at 2¼ or 4½ mph / 4 kph or 7.2 kph on grass, dirt or hard surfaces. The innovative foot pedal accelerator provides smooth driving, and extra traction wheels, which makes driving easy, comfortable and safe. Parents control the speed with the 2nd gear lockout feature. Let them keep the fun going with the included 12-volt rechargeable battery and charger. If you’re looking for a faster way to longer fun, check out our 12-volt Quick Charger, which charges the vehicle in 2 hours! Made in the USA. Weight Capacity Can hold up to 85 lbs / 38 kg.